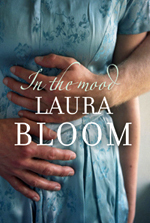 Laura Bloom’s new book: “In the Mood” is about war. The war that soldiers brought home together with their guilt for what they did and for their own survival. It is a war shattered in a million pieces that fill the air like a swarm of locusts getting into people’s nostrils and lungs and each and every one of their thoughts. It is a powerful spell that breaks only when the protagonists state what they want and go for it.